About a year ago, Louise and I, along with Rosalba from the Acorn School and numerous other educators began a journey of professional learning that focused on the principles of the Reggio Emilia Approach as well as drawing inspiration from the philosophy of Frances and David Hawkins. We began the journey when we conceptualized the first ever Reggio intensive, a week-long professional learning experience at Acorn School, that took place in the summer of 2013, followed by having the honour of experiencing and hosting the exhibit: Cultivate the Scientist in Every Child: The Philosophy of Frances and David Hawkins. Frances and David Hawkins were committed to reflecting on practice and thinking deeply about theory as it intersects with practice. Frances reflected continually on her practice as an early years educator while David has a place in world history as the official documenter of the Manhattan Project during World War II. This blog post is an attempt to document a yearlong journey of professional learning. With new technologies our community is continuing the tradition of reflecting and documenting. 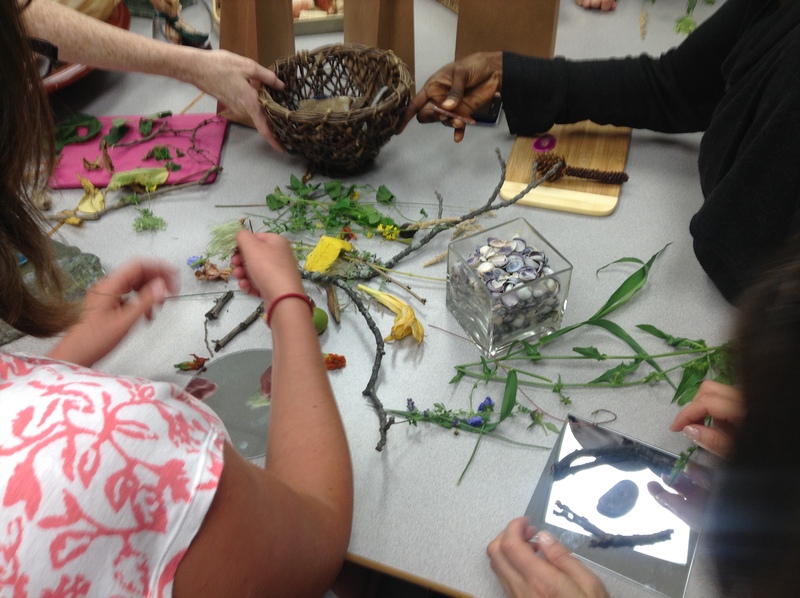 Along the journey’s way we were also inspired by the participants of the 2013 Reggio Intensive course. One in particular, Laurel Fynes, has inspired us on many levels but her fascination with Twitter as a medium for teacher collaboration helped to propel forward in a direction that we couldn’t chart, not knowing where it would leave but we could document and reflect on the course of the journey. We could see that there were levels of engagement with Twitter as a professional learning tool, and Laurel had reached elevated heights. She inspired us to think beyond our current level of engagement, which was to post and retweet but rarely comment or reply, so the thought of mediating a live Twitter chat seemed daunting and scary. Could we do something that we had never done? Louise and I have been fearless companions in professional learning for a long time. There was little hesitation when we asked ourselves that question. 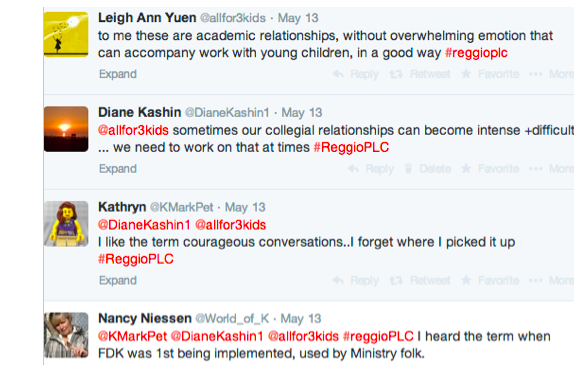 The next step was to create a hashtag – and we decided on #ReggioPLC, which stands for Reggio professional learning community. It now is listed amongst other educational hashtags by http://www.educatorstechnology.com/2014/04/a-list-of-all-educational-twitter-chats.html. We invite you to join us 9pm EST next week, May 27th for our next chat. What has brought our community forward on the journey was the inspiration drawn from the pre-primary schools of Reggio Emilia, Italy. 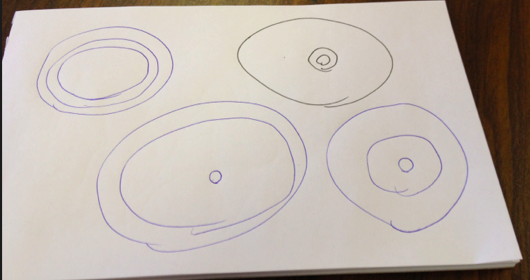 Louise and I decided that we would work through the principles of Reggio inspired practice as topics of our chats, starting from what we considered as the most significant, the image of the child. Every other Tuesday, without fail, we have had one hour of inspiring conversations with like-minded educators across the eastern seaboard. Every so often we host a chat that is more amendable to our international Twitter friends. Our goal is to broaden our community to include as many others as possible. We can learn from each other on Twitter and wherever we can learn together in person. Messing about with rocks and light in Lindsay. All of our experiences facilitating professional learning this past year have been heavily influenced by Frances and David – messing about with materials under the backdrop of the exhibit panels has been very meaningful on both a theoretical and practical level. We are eagerly anticipating our next experience at the Education Exploration Project. Our experiences so far have also been significant from a personal perspective. My theory about our professional learning experiences is that they have been personally validating because we have been open to the discomfort professional learning causes because of the cognitive dissonance that has been brought to us by our critical professional friends. We often speak of this experience on our Twitter chats and we have tried to label the experience with different words – including, “courageous conversations”, documented below. 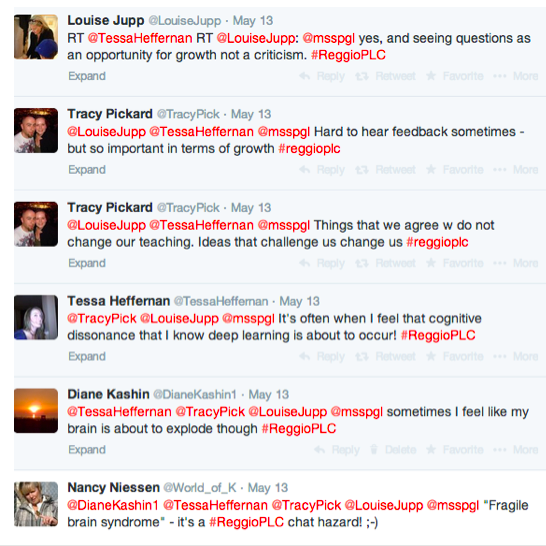 Later in the #ReggioPLC chat, Nancy coined the smile inducing term “fragile brain syndrome” which resulted from a conversation about others resistance to jump in and experience the changes we were facing as we drew our professional learning experiences from our inspiration of Reggio and Hawkins. 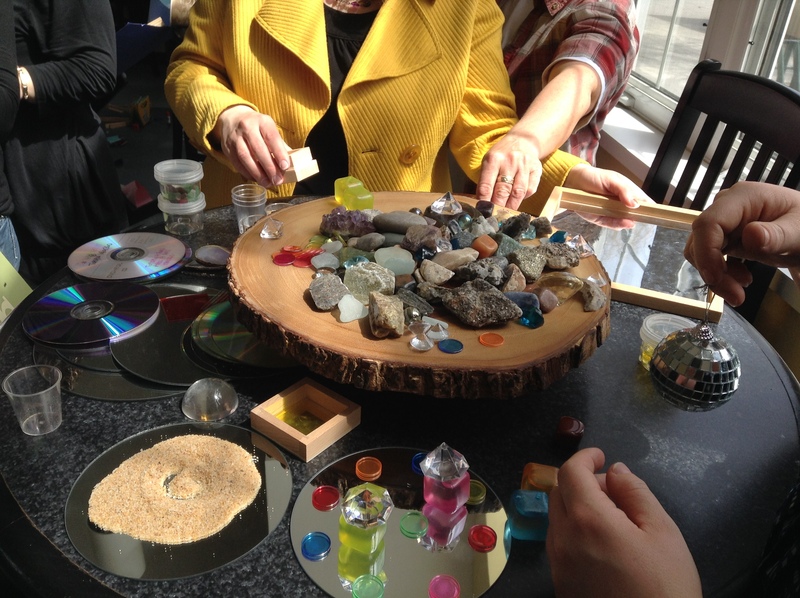 It was appropriate for Terie to end the chat with another term, “cognitive chaos”, one that I have heard her say many times when we have had the good fortune of meeting up in a face to face Reggio and Hawkins inspired professional learning experience. When loving and respectful professionals engage in a community they can serve as critical friends who can elevate and empower each other. Inevitably when we have our chats, someone speaks of others outside our community who have not been open to this experience of disequilibrium in professional practice. Thanks to the power of social media, our community had the opportunity to meet in person with Suzanne Axelsson, author of the blog, Interaction Imagination and preschool teacher in Sweden. When I had a conversation about resistance to change that seems to be a roadblock for some in their professional learning journeys, Suzanne talked to me about each of us having a personal, theoretical and practical side – and sometimes they are not equally divided – for some our practical side is more significant, for others it is the theoretical. Sometimes, our practices become very personal. When we take things personally, we can become defensive and not open to “cognitive chaos”. I took a picture of Suzanne’s illustration and then tried to capture the idea in the graphic that follows. I know I have a lot more thinking to do about this conceptualization but it is helping me to understand and help friends and colleagues as well as myself. I realized that the most difficult professional experiences I have had is when the personal concentric circle has become too large. I invite others to consider this by commenting on the blog or visiting our Facebook page at https://www.facebook.com/Tecribresearch. Suzanne had seen this phenomenon described in a university course but couldn’t remember the source. If anyone has that information to share I would love to follow up to explore the concept further.